Sites mémoriaux du génocide : Nyamata, Murambi, Bisesero et Gisozi is part of the Tentative list of Rwanda in order to qualify for inclusion in the World Heritage List. Rwanda has no WHS to date, and it saddens that the only entry on its Tentative List comprises the Rwandan Genocide Memorial Sites. The horrors of the Rwandan Genocide still determine the image of this small country, though it has come a long way since. The TWHS covers four locations connected with the memory of those 100 days in Spring and early Summer of 1994. Spread out over the country, they are: Nyamata (a church), Murambi (a school), Bisesero (a hill) and Gisozi (the main Genocide Memorial Center in Kigali). 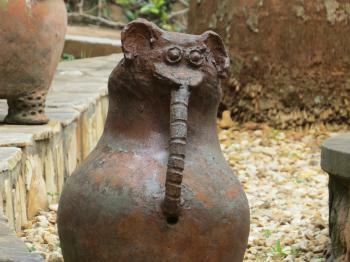 On my first morninng in Rwanda I headed to the Memorial Museum of Gisozi. I got there on the back of a moto-taxi, the ubiquituous and very convenient mode of transport in Kigali. The Museum is guarded tightly, they wanted to see what I had in my backpack and pockets. Police and soldiers in the streets are a common sight in Rwanda, especially at intersections and government buildings. The Genocide Museum was opened in 2004 to commemorate the 10th anniversary of the Rwandan genocide. It consists of a building with several exhibits and an outdoor area. Admission is free but I payed 15 US dollar for an audio guide. They even had one with commentary in Dutch. The exhibition centers mostly around information panels telling the story in Rwanda’s three national languages: Kinyarwanda, French and English. It makes clear that although the mass slaughter of Tutsis and moderate Hutus seemed like a short frenzy, a climate that has nurtured it was present since the Belgian colonial era and continued after independence in 1962. In the outdoor area around the museum around 250,000 victims are buried in a kind of monumental mass graves. There is a rose garden and small parks meant for contemplation. Day 2 in Rwanda meant another Genocide Memorial for me. I travelled by local bus about an hour north to the town of Nyamata. From the bus station it’s a short hop on a moto-taxi or a 15 minute walk to Nyamata Church (the exit is not signposted, but a nearby school named Les Colombes is). I found a modest building wrapped in purple and white ribbons. A female guide welcomed me in English and told the story of what happened at this place, which is one of the worst among the many murder locations. Some 10,000 people were killed inside the church building on April 7th, and thousands more outside of it. Tutsi had sough refuge in the church because it had acted as a safe haven during earlier outbreaks of violence before 1994. The building shows the scars of grenade shelling and the roof is perforated by bullet holes. To remember the death, their clothes have been left to occupy the church benches – a very moving gesture despite having seen pictures of it beforehand. The clothing is now slowly turning to dust. Underneath the church and in the gardens there are mass graves. The remaining skulls and bones show the signs of killing by machete, club and gun. Local people haven’t lost their Catholic faith since (although the foreign priests had fled long before the killings), and the proof is right across the road where this year a huge new Nyamata Church was opened. The old Nyamata Church was one of the earliest memorials in Rwanda. At first it wasn’t generally welcomed, and the Catholic Church even opposed to it. Rwanda is still actively working on this group of sites to become a WHS. The last update I could find dates from June 2015: it tells of the difficulties the nomination process encounters, facing opposition from some surviving relatives who do not want the remains of their family members being exposed. And also from others who feel that the memorial sites are too politically oriented. At both Gisozi and Nyamata I only encountered foreign visitors, so I asked the guide at Nyamata Church if local people come here too. She told me they do so, especially during the National Week of Mourning that is held every year from April 7-14. 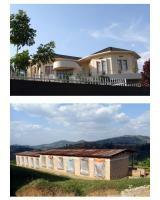 We visited Gisozi (then just called Kigali Genocide Memorial) and Murambi during a visit to Rwanda in Sept 2006. Like most tourists we were in Rwanda primarily to see Gorillas and other wild life but the “Genocide-related” sites were also of interest including places like the “Mille Collines” (aka “Hotel Rwanda”) and the Gacaca courts whose sessions in a village clearing we would often pass. Though whether these 4 sites deserve inscription is another matter! The Kigali Memorial consists of a pleasant, but not particularly striking, modern building completed in 2004 (photo) , a surrounding cemetery and rose garden, together with a black stone memorial containing the names of up to 250000 victims buried in mass graves in the surrounding cemetery (as far as I am aware the deceased were brought there from surrounding areas rather than this being the site of a specific “massacre”). The building houses an exhibition about the Genocide as well as education and documentation centres (and a café!). It is on the list for every tourist to Rwanda but claims to be aimed at Rwandans as well, for education, remembrance, research and reconciliation purposes. I found the exhibition interesting and not too tendentious in its assignment of blame both long term (though Belgium does take a “bit of a beating” for developing the Hutu/Tutsi split!) and at the time, but the location and structure failed to generate, in me at least, any great impression. Murambi was another matter altogether. The site consists of a school and surrounding fields where some 27000 people had gathered for “safety” only to be murdered. An exhibition centre had been built but stood unopened when we were there (and is, I believe, still not opened for reason of disputes whose nature hasn’t been made clear to me by any Web sites I have managed to find). The most “shocking” aspect of the site lies within the rows of cabins which formed the classrooms and dormitories of the technical school built as recently as 1990 (the genocide took place in 1994). Whilst some contain personal objects and clothes, and others piles and rows of bones/skulls, yet others contain complete mummified bodies preserved in quicklime but still displaying, wholly or partly, skin and hair. These are “laid out” in each room on simple wooden trestles. When we visited there were no restrictions on photography (I believe this may have changed since) but I could not bring myself to point a camera at corpses in such a voyeuristic act and restricted myself to the outside (photo). We have visited the “Killing Fields” memorials at Pnom Penh and Tuol Sleng and I would regard myself as pretty “rational” when it comes to photographing the realities of life around the World – but the seemingly “careless” way in which these victims’ bodies were laid out for exhibit pushed at my personal and cultural “acceptability boundary” in a way that (somewhat illogically!) bones and skeletons alone do not. Not so far as to say it shouldn’t be done but far enough to “disturb” – and that is possibly the reason for doing it? If anyone wants to see the sort of thing on display look at Genocide Archive Rwanda. There are other Genocide memorials around Rwanda which have not been included – we saw one at Kibuye Church which was less oriented at tourists than the above 2 sites were – quite how these 4 have been chosen I couldn’t say. The Kigali site seems particularly problematical, lacking any physical “authenticity” other than via the graves. Of course the entire concept of inscribing such a site is problematic and is perhaps the inevitable result of the earlier inclusion of Auschwitz and Genbaku Dome. China is thinking of the ruins of Unit 731 – Japan’s germ warfare experimental site. Where might it all end? The Rwandan sites can perhaps more easily be presented as a “non nationalistic” unarguably “humanist” nomination propounding universal values. But such sites can never be entirely apolitical - the Rwandan T List introduction rather unnecessarily and, maybe, unwisely, refers to the French “Operation Turquoise” centred on Murambi whose role in not protecting those being massacred is, of course “controversial” and is regarded by the Rwandan government as indicative of French support for the Hutus. On which point, it is rather surprising to note that this T List entry is provided in French despite the policy currently being implemented in Rwanda to switch from French to English as the main non-African language in schools, government and business! !